It’s officially summer in Texas, y’all. The sun is blazing, our air-conditioner runs almost constantly, and I’m wishing that muumuus would make a dramatic fashion comeback. Barring such a phenomenal event, I’m instituting my summer wardrobe rules, once again. Light, natural fibers and flowing shapes are key to surviving triple-digit heat. All the better, if bright colors and summery prints are heavily involved. Mood Fabrics has a ton of cotton prints that hit this sweet spot, right now. 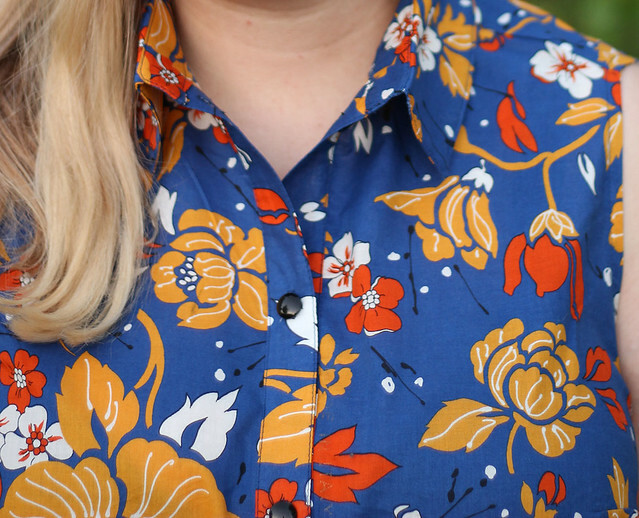 One of my favorites is this Italian Floral Printed Cotton Batiste, which comes in three pretty colorways–Blue/Yellow/Orange, Fig/Pink/Blue, and Black/Orange/Yellow–and is covered in large, retro flowers. As a batiste, it’s a lightweight fabric with a soft hand and flowing drape. In other words, it’s perfect for my ideal summer shirt! Since the print on this fabric is such a large scale floral, I wanted a pattern with some tailoring details, to break up that print a bit. It would be so easy to get lost amid those gigantic yellow flowers! 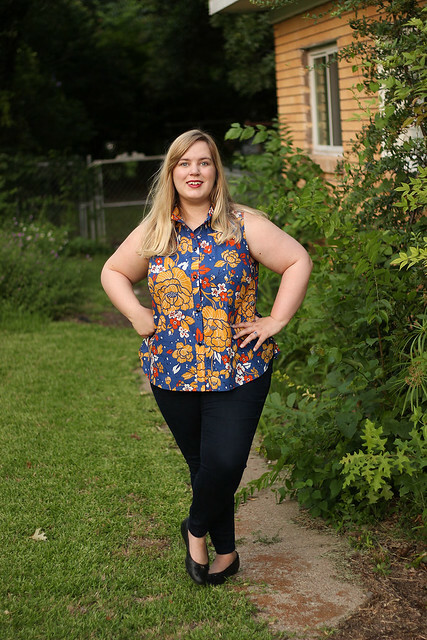 When I couldn’t find a pattern to suit my needs, I decided to hack my way to the dream shirt. Starting with McCall’s 7351, one of my tried-and-true shirtdress patterns, I lengthened the bodice on that pattern into a curved, shirt-tail hem that ended at the fullest part of my hips. Then, I added a split to the side seam and a bit of flare at the hips, for a breezier take on the traditional button-front shirt. 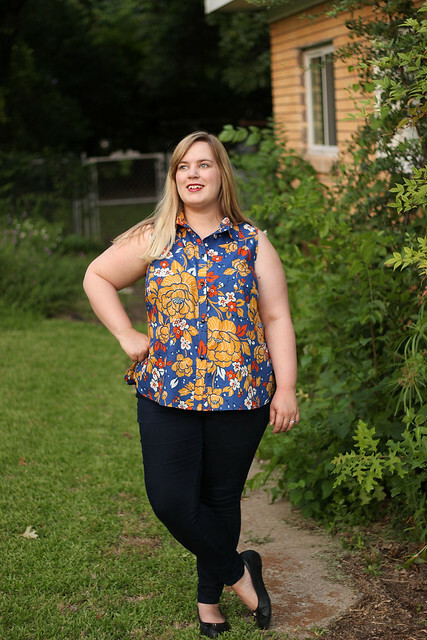 Everything I loved about the original pattern remained–that perfect collar and separate button bands, specifically–but had morphed into a casual summer top. As you might expect from such a fine cotton, this fabric sewed up like a dream. It doesn’t fray badly and presses really well, which is crucial in making a tailored shirt. I used a lightweight fusible interfacing on the details, to add a bit of heft to the fabric itself, which gave the right weight to the button bands and collar. Otherwise, this is pretty easy project. Maybe I’ve been sewing too many labor-intensive dresses lately, because finishing this blouse in one night felt like a marvel. To break up that awesome print even more, almost every detail on this shirt is top-stitched with blue thread. Even the side seams are turned under and top-stitched, to give both stability and extra detailing to the blouse. While this sounds laborious, in reality I just pop an edge-stitching foot onto my machine and it’s as easy as pushing fabric through the guide line. The yoke and armscyes are finished with the same pretty batiste and five black buttons close the front bands. My husband tried to convince me to opt for orange buttons, but I really love how the black grounds the print and pulls out the smaller details of the fabric. I might have to make a dozen more of these blouses, friends. Paired with my favorite dark denim jeans and flats, I’ve reached for this one twice in the past week. The fabric is so lightweight and cool against the skin that I can almost pretend it’s not 98 degrees outside! 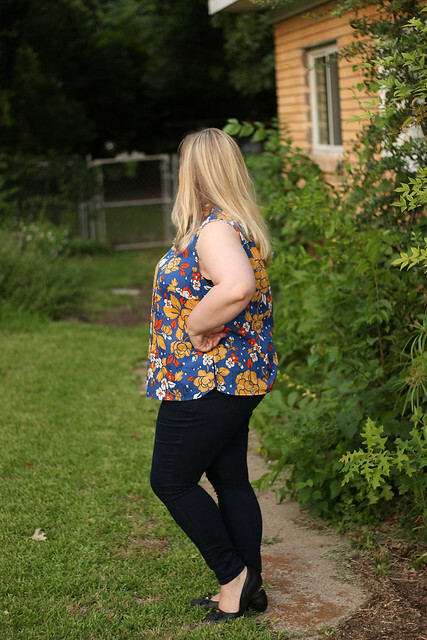 The shape turned out exactly as I imagined, as well, with a breezy fit that still hints at my curves in all the right places. Plus, let’s be honest. This print is just so much fun to wear. How can you look at it and not smile? I’m utterly smitten. My new summer uniform is off to a fantastic start!